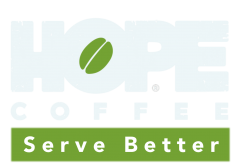 HOPE Coffee is thrilled to be a distributor for Compassion Tea! Compassion Tea is the "HOPE Coffee" of the tea world. They donate 100% of their after-tax profits to their parent organization, CompassioNow, which strives to bring the life-saving message of the Gospel and life-saving medical care to people in rural parts of Africa. If you have a coffee shop in your church, we also encourage you to contact the Compassion Tea Team for wholesale pricing at info@CompassionTea.com or 559-203-4359. Add a bag of this wonderful Compassion Tea to your purchase today!